Omaha’s ClearLift™ is a cutting-edge non-ablative approach to laser skin resurfacing that works beneath the skin’s surface to decrease the appearance of fine lines and wrinkles by stimulating collagen growth, correcting imperfections, including photodamage, uneven skin tone, and skin laxity. Skin resurfacing treatments to the face, neck and chest areas effectively address existing indications while also helping to protect the skin against future aging. 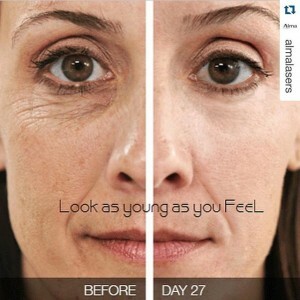 The result, tighter skin and a fresher more youthful appearance. 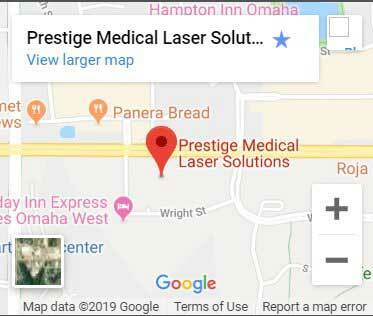 It is gentle enough to treat areas that are typically too sensitive to treat with traditional ablative lasers – such as the delicate skin around the eyes, neck, mouth, and chest. It is also an additional treatment for areas where injectables (Botox and fillers) are minimally used. Each of these conditions may be treated using a single technology or a combination of technologies to achieve outstanding clinical results. The laser’s multiple settings or modules are designed to work independently or together as a single cohesive, harmonious system. 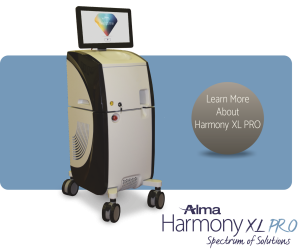 The Harmony XL Pro’s treatment will promote more collagen growth and in a short time after treatment, you will see a reduction in your fine lines, wrinkles, vascular lesions, pigment lesions, skin tone, and skin texture. After the treatment, you can return to your daily activities. The best results are realized after 3 to 6 treatments are completed. Each treatment is spaced 7 to 14 days apart. After completion of the recommended sessions, you will need to have a follow-up treatment once every 3 to 6 months for maintenance. Actual results may vary depending upon each patient’s reaction to the treatment.